Complex knee ligament injuries are frequently induced by knee dislocations following high-energy knee injury. Various complications develop after complex knee ligament injuries. Persistent instability, arthrofibrosis, and neurovascular problems are common complications. Persistent instability arises as the most common complications and develops in almost all patients. Arthrofibrosis is a common long-term complication causing serious problem after complex knee ligament injury. Neurovascular injury is a fatal and not uncommon complication. To prevent serious damage, early recognition and thorough assessments of complications are necessary. 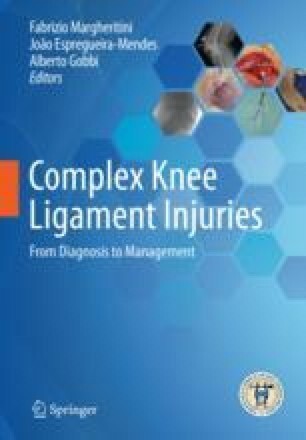 It is important to accurately diagnose complex knee ligament injuries, minimize possible complications, and properly address complications. The authors would like to thank professor Tae-Hwan Yoon and clinical fellows (Kwangho Chung, Jinyoung Jang, Hyun-Soo Moon, Chan-Myoung Woo) for their support in writing this chapter.